‘Shanti,’ Sheba Chhachhi, 1991. In her series of staged portraits, ‘Seven Lives and a Dream,’ Chhachhi, an activist as well as a chronicler of India’s feminist movement, captured women surrounded by objects of their own choosing. 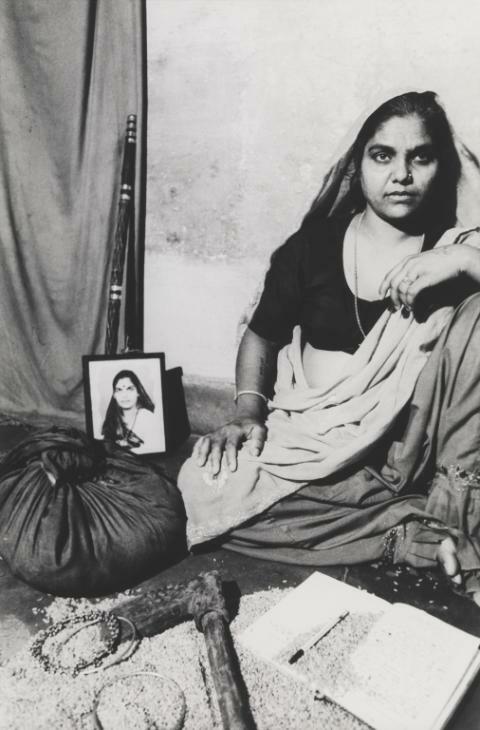 Dakshinpuri, Delhi, 1991, printed 2014. Courtesy of the Tate Collection. FOR BOTH WEARERS AND non-wearers of the sari, the garment lives in an ethnographic past, where time stands still. All the same, to wear one is to travel in time. A woman carries within the folds of her sari the memory of generations of women who tied theirs before her. To don a sari is to seek a connection with tradition. The sari seems antithetical to fashion, an industry founded on constant change. As a garment, it looks backward, betraying the imperative that Western fashion imposes on clothes – that is, to be innovated over and over. How, then, can wearing a sari anticipate a future, and bring into its folds a new generation of wearers? The philosopher Roland Barthes wrote, in his Mythologies, that clothes are often dehistoricised to the point of becoming naturalised. When we regard clothes as somehow eternal and true, we lose sight of them as fashioned and contingent. We foreclose the possibility of considering them as things transformed over time. The sari is precisely such a garment. Within the popular imagination, both in South Asia and across the global diaspora, the sari maintains a frustrating fixity. Its image as a static, timeless object that has remained unchanged over time has frozen it as not only traditional, but also sacrosanct. And if the sari isn’t broken, it doesn’t need to be reinvented. Nevertheless, the sari is a capacious object, one that has accommodated a range of cultural attitudes, as well as reinterpretations and borrowings over time. In the Indus Valley civilisation, the sari was designed as a strip of unstitched cotton or silk cloth (to stitch cloth was considered impure), draped around the waist, with part of the fabric passed through the legs. Ancient Vedic sources suggest that with the Aryan invasion, three separate pieces—a lower garment around the waist, fabric to cover the breasts and a shawl, or uttariya—made up a woman’s ensemble. Hellenistic influences added to the sari a belt or cummerbund, and women began to gather the fabric at the waist. Coats and jackets took hold with the arrival of the Persians, who introduced stitching across the subcontinent. With the advent of Islam, the practice of covering the head became common, and the pallu, draped over the shoulder, may have been used as a veil. Skipping ahead a few centuries, during India’s colonial era, the sari responded to seismic political changes throughout India’s history, and leading up and following India’s independence, the sari has taken on new perceptions, both in India and overseas, which open to iterations that defy the sari’s image as a traditional garment and that illuminate its potential for experimentation. Today, in the West, the sari has assumed a status of inviolability. It’s reserved for special occasions, like weddings, as if the act of wearing a sari is a ritual not just for a bride but also her guests. For the South Asian diasporic population, living in the US and Canada, obtaining a bridal sari is a fixture of planning a wedding, with much of the same anxiety inherent in finding a white wedding dress. Many of these women have been raised in middle- to upper-class families, are well-educated and understand the weight a sari places on them. The significance that a sari impinges on a woman is, however, a burden many aren’t prepared to deal with. We fret over the rules dictating the proper manner to drape a sari and the correct way to perform modesty, or grace, or nubility, or any of the other conditions a sari is supposed to fulfil. Furthermore, a gap in cultural transmission limits how much technical knowledge women hold about tying a sari, and this is seen most commonly at social gatherings like Indian weddings. Young women reveal their anxieties being unprepared to drape a sari properly, in turn revealing their anxieties over being unprepared to perform their womanhood. Older women are often designated to help tie saris, and they satisfy the need, and desire, for a certain correctness to be upheld. Every pleat should be of equal width and fall just so, and the length of the fall should graze the ground ever so slightly. Indian brides in America have adopted the practice of assembling a bridal party, and, all over Instagram, the retinue of young women who pose for the characteristic photograph—bride in the centre, the rest in descending order moving outward—all wear matching saris. Every sari in these photos, worn by Indian and non-Indian bridesmaids alike, is draped in a singular style: the Nivi drape. This style features an elegant skirt wrapped around the lower half of the body, with one end of the sari tucked into the waistband of a petticoat. Pleats are gathered at the waist, just below the navel, and cascade down the front. Following an additional turn around the waist, the loose end of the sari is released with a graceful pallu, a swath of remaining fabric thrown diagonally across the left shoulder, leaving the right arm exposed and free to move. As the dominant drape across India, and beyond, the Nivi drape makes little room for the countless other styles women can, and have, for centuries, draped around their bodies. In India’s regional villages, according to anthropologists Daniel Miller and Mukulika Banerjee, the Nivi drape is viewed today as not only the modern, but also correct way to drape a sari. Their 2003 book The Sari explores, through in-depth interviews, how women across India, both in urban and rural areas, pass down knowledge about tying a tie, its ceremonial and everyday uses, and what to wear during the various stages of a woman’s life. This process of intergenerational cultural transmission, mainly orally, either in the home or in that of a woman’s in-laws, strengthens the importance of the sari as an inherited, intimate and ‘lived’ garment. Teachers in Indian schools reinforce what’s taught at home, that for young women, the Nivi drape is how to wear a sari, therefore enforcing the break between, or distance from previous generations of women who may have been illiterate. Meanwhile, young women around the globe inhabit the Nivi drape as part of their education of fashioning themselves into women of tomorrow. Every sari in these Instagram wedding photos is pinned at the waist and at the shoulder, so that the pleats won’t fall out and the pallu won’t slip down. The manoeuvre to insert safety pins beneath the fabric of a sari so that they don’t show is tricky. But the risk of coming undone is worse; having a sari unravel at one’s feet, like the mythic character Draupadi stripped of both sari and virtue in the Hindu epic the Mahabharata, feels too dangerous to leave to chance. This imposes a sacrosanctity on the wearer that cannot be divested from the fabric of the sari itself. Few realise, however, that perfection isn’t inherent in the sari. The garment allows for relaxed and flexible ways of draping the sari across the body, such that the woman wearing it can continually manipulate the fabric to suit her own personal taste. Fewer still realise that the Nivi drape is only one of countless other drapes known across India’s diverse regions. The Indian state of Kerala is known for the unbleached white drape, considered pure and auspicious, and the styles range from a tribal drape, wrapping the lower half and brought up the torso and bringing the end over the shoulder back to front, to simple pleated and unpleated skirts wrapped around the waist distinguishing Christian and Muslim communities. The drapes of Karnataka often create a pants-like effect by passing one end of the sari through the legs, allowing for easier movement. A Christian drape from Goa, suited for farming or fishing, leaves the legs bare from the knee down. Some drapes in Andra Pradesh and Tamil Nadu are strictly worn by women in elite Brahmin communities. Across these regions of the South, owing to lesser Muslim influence, few women use the pallu to cover their head. Above the Deccan, however, it’s more customary to see the pallu transform the sari to change how a woman presents herself in public. In the state of Gujarat, in the west, rural drapes like chodhri and gamthi feature the fabric passed through the legs, affording flexible movement, as well as a pallu over the head to keep it covered. The seedha palla drape is the most common style for urban and middle class communities by Gujaratis, where the pallu is brought over the shoulder from back to front. A drape called pagadi palla, worn by farmers in Uttar Pradesh, wraps the pallu around the head to create a turban; another, the lapetawali sari, is a rural style worn without a blouse. A drape worn in Bengal, among lower classes, uses the pallu to cover the head and tuck the excess fabric into the waist; the nadia drape, common among middle- and upper-class women, features no pleats whatsoever. Upon arriving in Mumbai, and visiting the clubs governed by the British Raj, Jyananda Nandini became influenced by a newly introduced style of draping the sari, popular among Parsi women. This community of ladies wore saris with a blouse and petticoat and draped the pallu from back to front, a style that Jyananda Nandini adopted, but improvised, when touring Gujarat with her husband (she changed the direction of the pallu to its current style, to free the right hand). She popularised this style through an article published in a women’s reformist magazine. By incorporating the blouse and petticoat, Jyananda Nandini in turn influenced the attitudes of upper- and middle-class Bengali women toward an ideal of correct public appearance. During the decades of anti-British resistance, the sari was mobilised as a symbol of female empowerment. Dress became a tool for shaping the middle-class Indian woman into a chaste, upstanding Hindu figure, one who wasn’t, despite how the British saw her, in danger or in need of saving. According to the historian Partha Chatterjee, the atrocities done on women’s bodies, in the eyes of the British, fuelled a desire to deal with anxieties around what was known as the ‘women’s question.’ In his 1992 book, The Nation and Its Fragments, Chatterjee examines how the world/home, or public/private distinction of daily life mapped neatly onto a material/spiritual dichotomy: the home, the women’s realm, ‘the inner core of the national culture,’ had to be protected in the face of European subjugation and Westernisation. The sari, which could protect, preserve and strengthen the role of women, in turn took on a new interpretation, organising Indian women into respectable caretakers of the home and marking them as modest and self-emancipated. The sari’s role in the development of an Indian consciousness took on a new urgency during the period of anti-imperial resistance. Leaders of the Indian independence movement, fed up with the importation of British cloth, made cloth and clothing a key focus of their struggle for freedom. Mahatma Gandhi, realising the potential for cloth as a symbol for mobilising a people, promoted the spirit of swadeshi (‘home industries’) by urging the boycott of foreign goods and reviving the practice of spinning white khaadi cotton at home. The political significance of this revolutionary, grass-roots organisation, to wrest control from the British, cannot be understated. The undyed woven fabric became a symbol of freedom from British rule and of Indian national identity. For decades, following Independence, Indian politicians like Indira Gandhi popularised white saris as a visual nod to simplicity, and a demonstration of her reputation as untarnished. Despite the democratic ethos of such a practice—to say nothing of drape, only colour—conformity to the ‘white code’ is loosening, as many female politicians today realise how the practice speaks to a mythology of strategic dressing. Sari scion R̥ta Kapur Chishti’s book, Saris: Tradition and Beyond, is an exhaustingly researched corpus of sari drapes, designs and fabrications—collected over twenty years, and across fourteen of India’s sari-producing states. Her descriptive approach provides a taxonomy of dozens of drapes, across the lines of class and caste, revealing not only the sari’s communicative versatility, but also the range of technical specificity with which the garment must be understood. The picture that emerges of the sari is, despite its heterogeneity, of a densely woven tapestry: despite its differences and breaks across India, the sari upholds a continuity in shape and design, and even a fundamental identity. However, this vast compilation of knowledge, because it details the sari in all its differences, seems an act of preservation, an attempt to fix countless drapes into a catalogue that organises the wealth of human creativity and productivity into groupings. This is precisely the language we have to remember: the sari is alive. It’s an object that’s continually transformed and reinterpreted, over and over, through the creativity and boundless freedom of human imagination. The sari challenges Western notions of innovation, for the diverse range of possibilities for draping a seemingly simple, standard swath of fabric. It’s a supremely engineered garment, and a marvel of design, for the sheer fact that it affects countless, workable iterations. For centuries, dozens of drapes have allowed women to engage in various types of labour and in other activities: farming; fishing; house- and office-work; childrearing; sleeping. The practical need for a well-designed garment that moves with the wearer is of the utmost importance, and its utility, convenience and adaptability, combined with a sari’s gracefulness, are precisely how the garment will take on new iterations. Dr. Tanya Rawal-Jindia, a professor of gender and cultural studies at U.C. Riverside, started the ‘Saree, Not Sorry’ campaign in 2015 to use fashion to address xenophobia in the U.S. In a move that tears down deeply entrenched attitudes about the sari as belonging to Hinduism, or India, Rawal-Jindia writes, the sari ‘can always be reconfigured to suit your needs. The sari can teach us how to move through this world with more kindness. Respect the sari.’ Her stance, which challenges the boundaries of who can wear the sari, hits at debates around cultural appropriation and defending culture as something that can be inherently owned. The work of queer desi performer and scholar Kareem Khubchandani explores how South Asian gay men navigate rigid spaces of masculinity through the use of dance. It is through Khubchandani’s role as drag performer LaWhore Vagistan, however, that the sari is retied on an untraditional body, in turn affording a new understanding of how flexibly the garment can flow across a border like gender. What’s more, drag reveals how those removed from traditional ideas of femininity may inhabit and inherit knowledge of the sari to suit their own complex understanding of their own identity. Khubchandani and Rawal-Jindia imagine what it means to make a sari one’s own, as a lived garment in the West, worn not only for ceremonial occasions. Their approaches to customising and personalising the sari suggest new iterations for a design that can defy staid sacrosanctity in the popular consciousness. What’s more, their approaches challenge prescriptivist attitudes toward how the sari should be worn. On the runway, noted Belgian designer Dries Van Noten has continually explored the richness of South Asia’s heritage of artisanship, always paying homage to the values of handloom craftsmanship in his own work. His playful interpretations to draping sari fabrics, combined with his consistent collaborations with skilled labourers across India, suggest a model for borrowing across cultures that is neither exploitative nor reifying. We can trace a line through the colonial archives documenting and cataloguing the sociocultural differences that Europeans found across South Asia during the height of their governance, through to the work of researchers like Boulanger and Chishti, who have each compiled a volume of information describing the India’s sari drapes. Picking up the thread is the Indian agency Border & Fall, which has launched a nonprofit initiative called The Sari Series, to document eighty of India’s sari drapes in an accessible and comprehensive format. An anthology of two-minute how-to films addresses a contemporary, urgent need to understand the fluid and flexible nature of draping a sari. Border & Fall’s creative team, led by Malika Verma Kashyap, worked closely with Chishti, as sari advisor, to ensure that each video accurately represented the technique for arranging each drape. For Kashyap, this project doesn’t prescribe certain ways of draping the sari as correct or incorrect, but rather, illuminates the range of possibilities available to experiment with draping itself. The Sari Series makes available to a global audience an antidote to elitism, and reinvigorates the sari with a dose of democratism, even experimentality. It invites not appropriation but curiosity from the generate public, and seeks to expand how we understand the potential for fabric to conceal, protect and accentuate the body. Experimentation offers a crucial lens to consider the sari’s relevance today. With the knowledge that comes from watching and sharing these how-to videos, the thought of wearing a sari seems less fraught with anxiety. In addition, the potential for us to shift our perceptions about the age-old garment may shift, as well. We won’t, however, understand how to reinterpret the sari until we grasp the multiplicity of forms and possibilities it’s already been. That, perhaps, may be the most difficult challenge of all. The freedom to play with and realise new ways to fashion the sari determines how the garment may change. But what if, in changing how we see the sari, wearers alter their own self-image? Perhaps it’s not so much that we uphold the sari as inviolable so much as it’s the body wearing it that’s sacrosanct. It’s comforting to cling to an understanding of ourselves as somehow molded by tradition, shaped by forces that preceded us, rather than take up the mantle of self-renewal. The sari, then, is perched on the thin line between expressing the identity of the group the wearer is part of, as well as expressing her own. The margins for manoeuvring between these realms, self and world, is precisely the range of the sari itself. This range can be either as narrow as our anxiety for performing correctness, or as wide and varied as our imagination. The main similarity between fashion and fragrance seems simple enough: we wear both on our bodies. However, there are more complex coinciding structures within these decorative matters of the human flesh at second glance. Beginning with Coco Chanel’s eponymous ‘No. 5’ fragrance to the more recent trend of celebrity fragrances, the following series considers the correlations between the consumer industries and ideologies behind clothing and perfume. In 1977 I bought my first flat cloth cap – in navy cotton twill with leather detailing on each of the crown sections and a striped lining. It was a souvenir from a family trip to Jamaica, bought from a Rastafarian man selling his own designs at a stall in Kingston. At the time I saw the purchase as a defiant act: the feat of a post-colonial religious activist.